Veteran readers know that it's been a really long time since I've written an article focusing on any sort of "bearish fundamentals." I do know one thing with certainty: they [the governments of the world] can kick the can a lot farther than most of us imagine is possible. I know this is true because they already have. 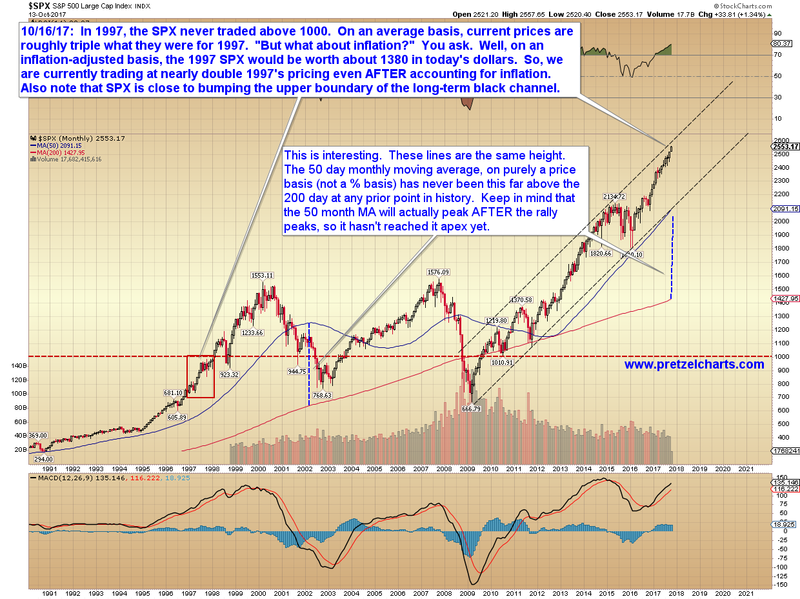 I intended that article to "close the book" on long-term bearishness for a while, partially because (as veteran readers also know) by February of 2013, I had decided we were in the midst of one of two possible scenarios: Long-term bullish, or really long-term bullish (remember how outlandish this chart seemed five years ago? 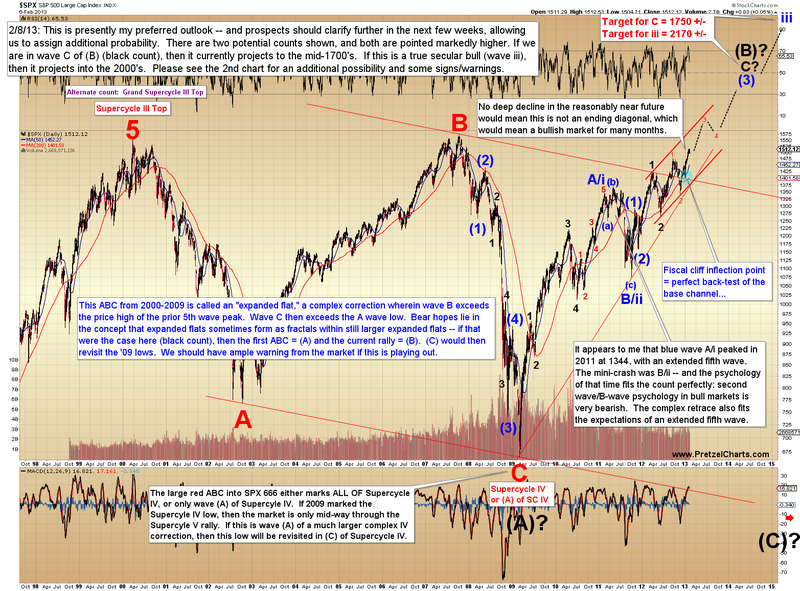 SPX to 2170? Unconscionable!). Point being, to my way of thinking in 2013, "worst case scenario" was not what traders would want to focus on over the coming years, because that type of thinking is completely counterproductive to making money during a bull market. And we're probably a little early to even start talking about such scenarios again now. Time will tell. But nevertheless, I'm writing such an article now, after a hiatus that has spanned over half a decade (aaaand that just made me feel old), primarily because I have recently become aware that there seems to be an entire generation of new investors who have absolutely no idea what's been going on. 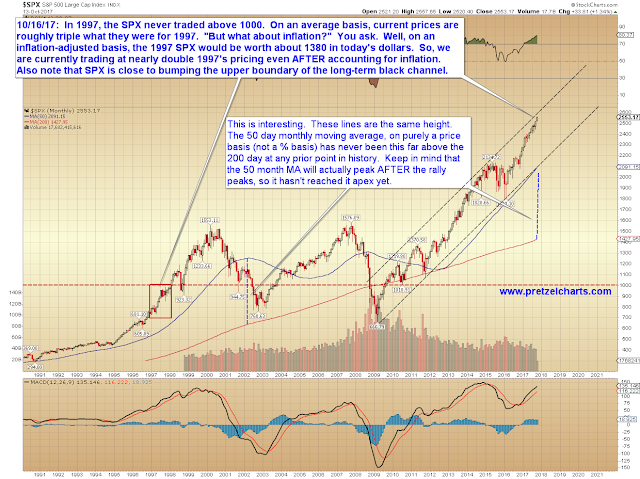 They apparently think the 2009-present bull market was driven by... I don't even know what. Magic fairies or something. So I don't want everything to come as a complete shock to them when it starts getting real. The time for education isn't in the midst of a crisis, it's beforehand. And again, don't get me wrong, I'm not saying that's going to happen tomorrow. But forewarned is forearmed. So it's time we opened this discussion again. I know many a trader who’s gone broke shorting too soon in a bull market. When there is extra cash floating around (liquidity), then some of that cash finds its way into the market. That means more buyers. More buyers than sellers means a rising market. Sometimes extra liquidity is the sign of a healthy economy (which is what has led to the thinking that "good economies create bull markets"). But in today's world, sometimes the extra liquidity has nothing to do with the fundamentals of the economy. Yet the S&P 500 is currently trading at roughly double the highest price of 1997 even after being adjusted for inflation. Obviously, inflation can't be the reason for current pricing, since we're trading at double the inflation-adjusted price. And certainly the current economy isn’t twice as strong as it was in 1997. So what gives? Therein lies your answer: What has driven this bull market higher for the last 8 years was not "economic fundamentals," but liquidity — in this case, provided by the world’s Central Banks (CBs). Essentially, the world’s various CB’s have been running the printing presses almost nonstop since 2009. Much of that excess cash has found its way into the stock market, which has driven prices higher. Some might say “artificially” higher, since the fundamentals of the real economy do not support current pricing (especially in terms of production). So, the CB’s have been responsible for inflating asset prices by flooding an exorbitant amount of liquidity into the world. One problem with their "free money" approach is that it sends false signals to the market that there is more demand for things than the actual, real market would support. Imagine you owned a hotel in a small town for the last 10 years. After 10 years, you have a pretty good feel for what the market supports for your business. You have the right number of employees, the correct hours set for them, your income and expenses are well-balanced, etc..
Then one day a large, traveling band of acrobats shows up, and they rent out an entire wing of your hotel. Well, that’s good news, right? You’re pulling in more income than ever! These acrobats initially book their rooms for a week, so you don’t make any changes whatsoever to your business model. You understand this situation is temporary. A week goes by, and the acrobats announce that they’ll be staying for another week. Great! Still nothing Earth-shattering — you might have to get a few employees to work longer hours, but again, your business model doesn’t change. The next week passes, and the acrobats announce to you that they’ve decided to set up shop in your town, so they're going to "move in" for an undetermined amount of time. They are a superstitious lot, and they don't believe in owning land, so they tell you they'll be staying at your hotel for “at least 10 years.” Holy cow! Amazing news! But... Your hotel is no longer going to be large enough to support its usual customer base, because these acrobats will be “permanently” occupying one whole wing. This changes your business model. So you decide to build a new wing, similar in size to the wing that is now “permanently occupied” by the acrobats. You also figure it's a good time to remodel, and you decide on a "more upscale" look for the hotel. You can charge higher rates now, because with the acrobats providing a steady source of income, who cares if a small handful of your old customers can no longer afford the stay? Plus, wow! Interest rates are incredibly low right now, so you might as well finance everything at once. The acrobats will more than cover the payments on a 10-year loan anyway. When they move out, you'll be paid off! You also hire more employees and expand the hotel’s restaurant. Business is better than ever, and things are going great! After a while, your business has not only adapted to "the new normal," but your business model is now, in fact, predicated on it. After a while, "the new normal" is just normal. And you forget what life before the acrobats was like. But then... sudden tragedy strikes. Only three years after the acrobats told you they’d stay for “at least 10 years,” their star performer suffers a nasty fall and is permanently injured. He and his family leave the hotel. So do his two performance partners. The rest of the troupe then decides this location is "bad luck." They tell you that despite their long-term promise, they’re not going to stay any longer than they already have. They pack up and leave town. Your hotel is suddenly very empty. And not only very empty, but very large and empty. You have to lay off half of your workforce immediately, including three-quarters of the Housekeeping staff. The huge, recently-expanded restaurant starts running specials to attract more customers. At first, it's "Kids eat free on Tuesday and Thursday!" When that fails to bring in enough business, you try: "Kids eat free on any weeknight! Then: "Kids eat free every night!" And the loan payments! Sheesh, those seemed like a walk in the park when the acrobats were in town. Now you can barely keep up. You slowly begin to realize that you may have to sell the entire hotel... But who's going to buy a huge, fancy hotel that is clearly overbuilt for this Podunk area? You realize selling is probably not going to work, and for the first time in your ownership, you begin to consider bankruptcy. The acrobats sent false signals to the market (which in this case, was you). How could you know these signals weren't real? You really couldn't. Sure, you could have kept the hotel the same size, but you would have been turning away an awful lot of business if you had. Who can blame you for expanding? Expansion was what the environment seemed to call for. This is the same type of trap the Fed creates for businesses when it floods the market with liquidity. All that liquidity is mistaken for genuine economic activity. So, of course, businesses respond to it as businesses do, just as if it were indeed genuine activity. But when the money pumping stops, as it invariably must, businesses are left high and dry, with too little genuine economic activity to continue supporting them. And this is likely why we have yet to see any "dire unintended consequences" from the QE programs. This ain't our first rodeo, after all -- most of us lived through the 90's boom (on the back of Greenspan's "free money" policies), and we likewise lived through the bust at the turn of the century. We then lived through the boom of 2004-2007, which came on the back of the housing bubble, which again was created on the back of Fed policy. And we lived through the subsequent 2008-2009 crash. And now we've lived through this "new" recovery, driven by the Fed and the world's Central Banks. And through all that, we've learned this: The problems never seem to come while the Fed is running the pumps; the problems come afterwards. Everything booms when the cheap money is flowing -- but this "false boom" is, in fact, exactly what plants the seeds for the future bust. It seems to be an endless cycle of the current Keynesian economic policies. So we've seen this movie before, and we know how it ends. What we don't know yet is exactly when. And exactly how bad the destruction will be when the inevitable bust comes, because this time, we are in uncharted waters. The last couple boom/bust cycles were primarily caused by "easy money" policy -- they weren't "easy money policy" PLUS $4 trillion dollars of QE. Plus the pumping of EU, BoJ, and BoE. If the "bust" output is inversely correlated to the "boom" input, then this next bust may be even worse than anything we've yet seen in our lifetimes. We also have to take into account that, beyond the Fed's significant pumping, Federal government spending increased dramatically, starting in 2009. This has been politicized quite a bit, but we are not discussing this for political reasons; only because it's relevant to the equation. Most people know that in only the last 8 years, the US national debt doubled, from about $10 trillion to about $20 trillion. That is an awful lot of money being pumped into the economy over 8 short years. And for all that effort, we got a tepid "recovery." Plenty of folks lament the debt we'll be passing to our children, but how many have stopped to consider what we actually purchased with that $10 trillion? And what happens when the effects wear off. Of course, how many more times can we do that? If we doubled the national debt every 8 years, as we've done now over the past 16 years... well, nobody wants to think about that. Shortly after I wrote most of this, Trump's new tax plan cleared its first hurdle. That tax plan might keep the "free money" going for a while, so keep that in mind. And likewise keep in mind that more free money is just going to add to the above numbers, it isn't going to "cure" anything. Beyond the Fed, keep in mind that, even though the EU is on the "verge of collapse," it is still pumping money into the markets; as are other CB's. Since the EU is going to cease to exist in the (relatively) near future, and for other reasons, there is a lot of foreign capital flowing into our (America’s) markets right now. And that’s continuing to fuel the bull. We are still perceived as the world’s safe haven, so bad times elsewhere means more money flows into our markets. All this foreign capital is in fact part of what allowed the Fed to quit pumping so much in the first place. The foreign central banks, and heavy-hitter foreign investors, are doing the pumping for them now. Which brings us to our next point: A lot of readers have asked (in the years since my last "bearish fundamental" article), "Why can't the Central Banks keep this going forever?" You can't create material wealth from thin air because material wealth is the result of exchanging something tangible for something else tangible: Goods, services, etc., must be produced somewhere up the line, and then they can be exchanged, and that activity produces material wealth. There is no way to produce wealth from "thin air" any more than you could produce a house from "thin air." Summed up in its simplest possible form: You can't get something for nothing unless you have previously gotten nothing for something. So, that's reason number one as to why the Central Banks can't keep this false prosperity going to infinity. The game only works if people perceive money to have value -- and money loses its value if it's treated like it's a worthless commodity that can be endlessly produced from nothingness. Thus the Central Banks know they're walking a fine line when they're running these programs, which is why they wear suits and frown a lot (I'm only half-joking -- "image" is very important to any confidence game); and why there was/is always so much talk reassuring the public that they would/will "taper" and "tighten" and "reduce balance sheets" and so on. If people were to lose faith that there was some degree of responsible management behind this, then the whole jig collapses overnight. So the CB's can't do this endlessly, because everyone knows it's "cheating." We're willing to overlook a little cheating, as long as we're reassured that it's temporary and under the "strictest" control. But endless cheating would crack the foundations of faith that keep the whole system functioning. Reason number two is that everything moves in cycles of endless change. You've heard me say this before, but consider this: Change, in a very real sense, is exactly what creates our perception of time. Without change, time effectively ceases to exist. Imagine if all movement in the Universe, down to the subatomic level, were to completely stop right where it is at this exact moment. If that were to happen, then the Universe would be "frozen in time." Time itself would cease to exist. Stopping change from occurring would stop time from advancing. Time is fundamental to the nature of reality. Change is fundamental to the nature of time. So change itself is likewise fundamental to the very nature of reality. The Central Banks may appear all-powerful, but they are not capable of altering the nature of reality. So, even if they could cheat the system as often as they wanted (which, as we just established, they can't), then eventually the fundamental nature of reality would impinge upon the dream. Something would happen that alters the playing field. It's unavoidable. "Black swan events" (unexpected high-impact improbable events) are really a misnomer, in the sense that, while each improbable event may in itself be unique as a standalone, such events are not rare as a collective. So an individual "black swan" may be rare, but flocks of black swans are not. They are instead all-but-guaranteed types of events that come about (in a seemingly-cyclical fashion) because time itself is -- fundamentally -- constant change. And if things are going smoothly, then change can only be in the opposite direction. The moment the sun reaches its zenith, it begins to set. There's nowhere else for it to go, unless we altered the nature of time itself and could somehow freeze everything, to stop change from occurring. But not even Janet Yellen's impenetrable hair helmet can halt the progression of time. So the Central Banks hope this will die the way they "want it" to, but they do know it has to die eventually, to preserve faith in the system. Obviously, they hope it will not be a Black Swan Event that ends this round, because they lose all control in that situation. But for reasons just discussed, that is a very real possibility. One way or the other, it does eventually end. As I said, it may not be tomorrow, and may or may not be "soon," so I'm not saying we should start worrying obsessively and blindly shorting every rally. In fact, I would strongly suggest you do not do that. Let's partake of the punchbowl for as long as the party is still going. When the time comes for it to end, the signals will be there. As I said, I wrote this partially because I wanted to provide at least a bit of "early" education for the new generation of investors. And I did want to put to rest the myth that this "new prosperity" could go on "forever." It cannot go on forever, because the fundamental nature of reality forbids it. Trade safe.